US Economy in Q2 2018 came in at +4.1% – a strong number. Consumer spending, net exports and business investment were all highlights, though half of the +1.1% contribution from net exports (imports versus exports) was considered to be the Chinese pre-paying for soybeans before tariffs went into effect. Still, a +0.5% gain in net exports would be the highest positive GDP impact since 2014 – most quarters since 2009 have a net negative net export weight on GDP. The Atlanta Fed is estimating Q3 GDP to grow at +4.4%, though that can change a lot over the next two months. As expected, the US Federal Reserve kept interest rates steady in their July meeting and had no particular update on the decline of their balance sheet as they slowly unwind Bernanke’s QE program. The markets are projecting that they will raise rates by +0.25% in their next meeting in September. This increase seems very likely g iven the economic projections for Q3, and would also fit the outline given by former Chair Yellen last year (and endorsed by current Chair Powell this year). Interest rates should also move upwards as the US government further increases its borrowing under its widening deficits – that pressure will not abate any time soon. US Economic News was supportive overall. Consumer inflation continues to grind higher, with the latest numbers at +2.9% year-on-year and a +2.3% core reading (ex-food and energy inflation). +2.3% is higher than the Fed’s +2.0% target but recall that the philosophy is to let the economy “run hot” versus raising rate rapidly. Core retail sales (ex-car and gasoline expenditure) rose +0.3% month-on-month in June, helping an overall pick-up on an annual basis (see graph right). Sales of existing US homes, however, fell -0.6% month-on-month as prices increased. Year-on-year, this gauge is down -2.2% while prices are up +5.2%. Housing starts and building permits are also down to 2017 levels. This is a real affordability issue and one must wonder how stretched these homebuyers are. At least unemployment remained low at +3.9% with the broader under-employment rate declining to levels not seen since 2000 (7.9%). Manufacturing payrolls beat expectations at +37,000 for June and have been at this relatively higher pace for the last ten months. The losses from the 2008-2010 years, however, have not been fully made up, even eight years later. While the labor force participation rate has leveled off at a relatively low 63%, prime-age participation (25 to 54 years old) continues to improve (currently 82.1%, cycle low was 80.6%). This increase participation implies higher average hourly earnings (see graph left) to come. The only negative in the report was that those holding multiple jobs increased to a new high of just over eight million workers, beating the numbers seen in 2005 to 2009. Venezuela’s Maduro avoided an assassination (via exploding drone – truly a modern approach!) and fell under investigation by the US for a $1.2 billion money-laundering case. India and China are the second and third largest recent importers of oil from the beleaguered country though some of the Chinese deliveries are for loan repayments. Venezuela’s oil production dropped by another 47,500 bpd in June, compared to a month earlier and 800,000 bpd from the same time in 2017. Total production dip will be below 1 mbpd at this rate within months. Canada is seeing a real slowdown in their housing market with Toronto sales down 32% in April versus April last year, with prices also down 11% in April versus April last year and more inventory. Will that bleed into the US or other markets is yet to be seen. 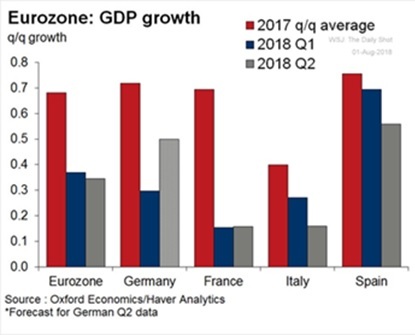 The European Economy Stuttered to a lower level versus last year (see graph on the right) as retails sales missed expectations (+1.2% versus +1.4% expected, year-on-year). German manufacturing, a star and important driver of activity in the EU’s largest economy, had a sharp -4.0% contraction for June, erasing the +2.6% gain in May and followed the -2.2% decline in Q1. Looking ahead, manufacturing orders fell 0.8%, missing expectations as well. Germany remained a stalwart of fiscal discipline as total government debt fell below €2 trillion at the end of 2017 for the first time since 2010, almost to the EU “required” maximum of 60% of debt to GDP. The ECB will reduce its quantitative easing by purchasing €15 billion of bonds per month starting in October instead of €30 billion and cutting to zero at year-end. EU unemployment stayed at 8.3% at the end of June and inflation ticked up to +2.1% which supports the ending of QE. Turkey continues to falter as the lira has fallen by about 1/3rd from 12 months ago and three-year bond yields are above 21%. Erdogan’s son-in-law who is in charge of the wide-sweeping finance ministry needs to step up his game. The strong US dollar is not helping emerging markets like Turkey who have foreign currency exposure. 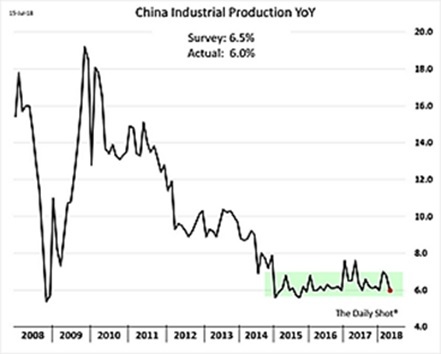 The Chinese Economy grew at an expected +6.7% in Q2, its slowest pace since 2016. Investment in buildings, factories and other fixed assets continued to weaken, rising +6.0% in the first half of the year, decelerating slightly from the +6.1% rate in the first five months. Macquarie estimated that spending on railways, highways and other infrastructure rose +3% over the first six months of 2018, compared with +15% for the whole of 2017. Industrial production grew +6.0% in June from a year earlier, slower than the +6.8% pace in May. The graph on the right shows how pegged that statistic is – it will not fall below +6.0%! 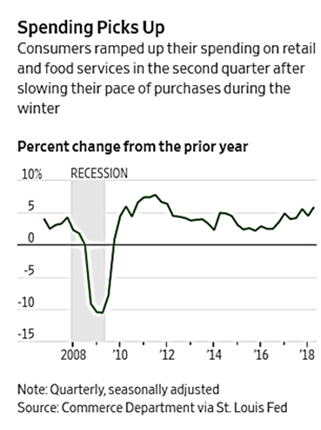 Can one say “government manipulation?” Retail sales bucked the trend, rising +9.0% in June from a year earlier, compared with +8.5% in May. Adding to the headwinds, many exporters crammed orders into the first half of the year to beat the tariffs, suggesting that factory activity risks to slow in the coming months – unless the government opens the money spigot, which it did. Facing the US tariffs as well as a projected slowdown in its 25-year housing boom, Beijing added further tax cuts on research and development as well as announced plans to issue bonds to expand infrastructure (how much and why was unclear given the $1 trillion “One Belt, One Road” global infrastructure plan). In addition, the central bank started pumping money into the banking system, causing seven-day short-term rates (SHIBOR) to fall from 3.0% at the beginning of the year to 2.25% in early August. In essence, quantitative easing to a debt-dependent economy. The relative austerity from earlier in the year is out the window. The banks needed the capital support given the scale and concentration of “shadow banking” which avoids capital reporting and thus losses can be catastrophic (see FT graph below showing the banks most at risk and the geographic concentration). Meanwhile, the younger generation is embracing consumer debt fueled by credit cards and peer-to-peer lending, with total consumer debt doubling as a proportion of GDP from 20% to 40% between 2013 and 2017 (and remember that GDP is growing at ~7% per year during that time!). This is sounding like the transition from an export-led to a consumer-led economy is going too well. July’s poster child for corporate default due to over-borrowing is coal miner Wintime Energy, which borrowed $8 billion in less than five years as it expanded into finance and logistics. Finally, with the yuan falling about 10% against the US dollar over the last three months, one should consider the fact that China has $500 billion in dollar-denominated loans outstanding – a decline in dollar receipts could cause a run that would even put a dent into the government’s $3 trillion foreign exchange reserves. Japan and Korea put up some disappointing year-on-year industrial production numbers of -1.2% and -0.4%, respectively. Both countries were expected to put up positive results. 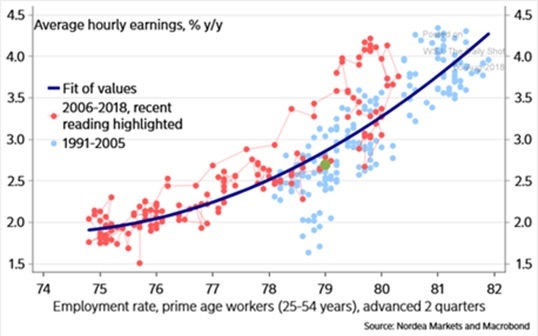 Japan wage-earners did see a nice jump in monthly cash earnings of 4% year-on-year so perhaps the average person is starting to benefit from the low unemployment.